The Edmund Pettus Bridge is a bridge that carries U.S. Route 80 Business (US 80 Bus.) across the Alabama River in Selma, Alabama. Built in 1940, it is named after Edmund Winston Pettus, a former Confederate brigadier general, U.S. Senator from Alabama and Grand Dragon of the Alabama Ku Klux Klan. The bridge is a steel through arch bridge with a central span of 250 feet (76 m). There are nine large concrete arches supporting the bridge and roadway on the east side. 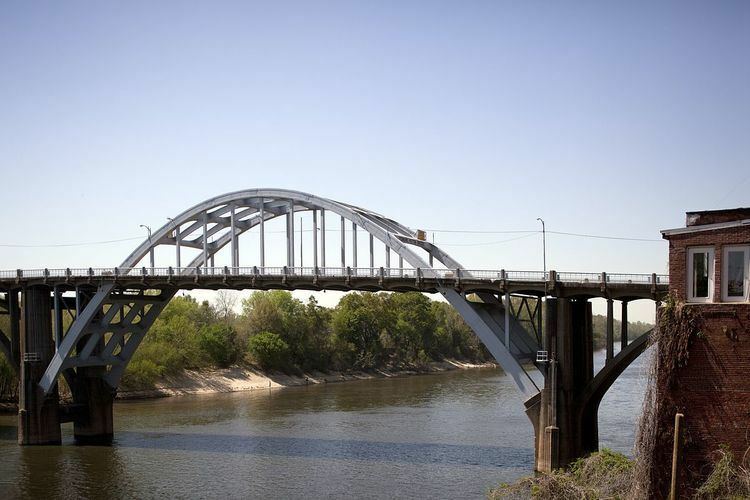 The Edmund Pettus Bridge was the site of the conflict of Bloody Sunday on March 7, 1965, when armed policemen attacked civil rights demonstrators with billy clubs and tear gas as they were attempting to march to the Alabama state capital of Montgomery. The bridge was declared a National Historic Landmark on March 11, 2013. The bridge carries four lanes of US Route 80 over the Alabama River, from Selma on the west side, to points east. The bridge has a total of eleven spans. It has ten smaller concrete spans, while the main span in the center, over the river, is made of steel. Because Selma is built on a bluff over the river, the west side of the bridge is higher than the east side. The center of the bridge is 100 feet (30 m) over the river. In 2011, the bridge was listed as functionally obsolete, meaning that it doesn't meet current design standards for its current traffic load. The bridge is named after Edmund Winston Pettus, who was born in Limestone County, Alabama, to John Pettus and Alice Taylor Winston in 1821. He graduated from a public high school and attended Clinton College. He then went on to Tuscumbia, Alabama, to study law and was admitted into the state's bar association in 1842. In 1844 he was elected to serve in the seventh Judicial Circuit of Alabama as a solicitor. From 1847-1849 he served as a lieutenant with the Alabama Volunteers during the Mexican–American War. From 1854 he served as a judge in the seventh Judicial Circuit of Alabama, until resigning in 1858. After resigning as judge he went back to Selma, Alabama where he again practiced law. Following the outbreak of the American Civil War he served with the 20th Regiment Alabama Infantry, eventually attaining the rank of brigadier general in 1863 and being assigned a command in the Army of Tennessee. Following the war he resumed his law practice in Selma. At that time he also led the Alabaman Ku Klux Klan. He was residing in Selma when he was elected as a Democratic United States Senator from Alabama in 1897 and 1903. He died in 1907. Edmund's brother John Pettus, was a Mississippi politician. Because of Pettus's role in supporting slavery and racism, there is a movement to rename the bridge. With the fiftieth anniversary of Bloody Sunday in 2015, a group of college students and others organized a campaign to rename the bridge. Changing the name would require approval from the State of Alabama. Proponents of changing the name have not offered a specific name as an alternative. An earlier attempt to change the name in 2010 failed. Some Selma residents are opposed, believing that changing the name will do nothing to improve race relations in the country. An earlier bridge at the same construction was built in 1885 to carry mule loads of cotton. It was a two-lane wooden swing bridge that had to be opened by hand. The Edmund Pettus Bridge was designed by Selma native Henson Stephenson and opened to traffic in 1940. In 1965 voting rights for African Americans were a contentious issue. In Selma, Alabama, voting rolls were 99% White and 1% African American, while the 1960 Census found that the population of Alabama was 30% nonwhite . In February 1965, state troopers and locals in Marion, Alabama, started a fight with some 400 African American demonstrators. Jimmie Lee Jackson was shot in the stomach, and he died eight days later. As word spread, the case became a catalyst for civil rights activists, including Martin Luther King, Jr.. SCLCs Director of Direct Action James Bevel strategized a plan for a peaceful march on the state's capitol, which required crossing the bridge. There were many acts just like this one that involved killings, and many more that involved economic and health problems. On March 7, 1965, armed policemen attacked peaceful civil rights demonstrators attempting to march to the state capital of Montgomery in an incident that became known as Bloody Sunday. Because of the design of the bridge, the protestors were unable to see the police officers on the east side of the bridge until after they had reached the top of the bridge in the center. The protestors first saw the police while at the center of the bridge, 100 feet above the Alabama River. Upon seeing this, protestor Hosea Williams asked his fellow protestor John Lewis if he knew how to swim. Despite the danger ahead, the protestors continued marching without stopping. They were then attacked and beaten by police on the other side. Televised images of the brutal attack presented Americans and international audiences with horrifying images of marchers left bloodied and severely injured, and roused support for the Selma Voting Rights Movement. Amelia Boynton, who had helped organize the march as well as marching in it, was beaten unconscious. A photograph of her lying on the road of the Edmund Pettus Bridge appeared on the front page of newspapers and news magazines around the world. In all, 17 marchers were hospitalized and 50 treated for lesser injuries; the day soon became known as "Bloody Sunday" within the African American community. Since 1965, many marches have commemorated the events of Bloody Sunday. On its 30th anniversary, Rep. John Lewis, former president of SNCC and a prominent activist during the Selma to Montgomery marches, said, "It's gratifying to come back and see the changes that have occurred; to see the number of registered voters and the number of Black elected officials in the state of Alabama to be able to walk with other members of Congress that are African Americans." On the 40th reunion of Bloody Sunday over 10,000 people, including Lewis, again marched across the Edmund Pettus Bridge. Also, in 1996, the Olympic torch made its way across the bridge with its carrier, Andrew Young, and many public officials, to symbolize how far the South has come. When Young spoke at the Brown Chapel A.M.E. Church, as part of the torch ceremony, he said, "We couldn't have gone to Atlanta with the Olympic Games if we hadn't come through Selma a long time ago." In March 2015, on the 50th anniversary of Bloody Sunday, U.S. President Barack Obama, the first African-American U.S. president, delivered a speech at the foot of the bridge and then, along with other U.S. political figures such as former U.S. President George W. Bush and Representative John Lewis and Civil Rights Movement activists such as Amelia Boynton Robinson (at Obama's side in a wheelchair), led a march across the bridge. An estimated 40,000 people attended to commemorate the 1965 march, and to reflect on and speak about its impact on history and continuing efforts to address and improve U.S. civil rights. Bloody Sunday and the events of the Selma to Montgomery marches were re-enacted on the bridge and depicted in the films Selma, Lord, Selma (1999) and Selma (2014). Marilyn Miller's non-fiction book, The Bridge at Selma (Turning Points in American History) (1989), "describes the far-reaching repercussions of the events of March 7, 1965 when 525 men, women, and children in Alabama attempted to march from Selma to the state capitol in Montgomery in order to register to vote."